Deoxyribonucleic acid (DNA) is a large polymer of nucleotides that is way too large to enter the cell membrane. In order to utilize external DNA, bacteria cells secrete exoenzymes (DNases) outside of the cell that hydrolyze DNA into nucleotides. The nucleotides can then move across the cell membrane via transport proteins to be utilized. The cell can use nucleotides to make nucleic acids and to use as a source of nitrogen, phosphate and carbon. Extracellular DNases have been reported in a relatively small subset of prokaryotes, including a number of human pathogens. DNA hydrolysis is tested by growing an organism on a DNase Test Agar plate (providing nutrients and DNA) and then checking the plate for hydrolysis. DNA Hydrolysis test or Deoxyribonuclease (DNase) test is thus used to determine the ability of an organism to hydrolyze DNA and utilize it as a source of carbon and energy for growth. It helps in the detection of deoxyribonuclease activity of bacteria and fungi, and especially for identification of pathogenic Staphylococci. To differentiate organisms based on the production of deoxyribonuclease. The test is used to determine the ability of an organism to hydrolyze DNA. DNase agar is a differential medium that tests the ability of an organism to produce an exo-enzyme, called deoxyribonuclease. DNase are extracellular endonucleases that cleave DNA and release free nucleotides and phosphate. DNase agar contains nutrients for the bacteria, DNA, and mostly methyl green as an indicator. Methyl green is a cation which binds to the negatively-charged DNA. Deoxyribonuclease allows the organisms that produce it to break down DNA into smaller fragments. When the DNA is broken down, it no longer binds to the methyl green, and a clear halo will appear around the areas where the DNase-producing organism has grown. In DNase agar without indicator, the hydrolysis of DNA is observed by a clearing of the agar after addition of HCL (oligonucleotides dissolves in acid but DNA salts are insoluble). The acid precipitates unhydrolyzed DNA making the medium opaque. Therefore, DNase producing colonies hydrolyze DNA and produce a clear zone around the growth. Pancreatic digest of casein (10 g), yeast extract (10 g), deoxyribonucleic acid (2 g), NaCl (5 g), agar (15 g), methyl green (0.5 g), pH 7.5. Using a sterile loop, inoculate the DNase agar with the organism to be tested on the test area. Incubate the plate at 35-37°C for 24 hours. After incubation observe the color change in DNase with methyl green. Flood the surface of agar with 1N HCL solution. Tip off the excess acid. Allow the reagent to absorb into the plate. Observe for clear zone around the colonies within 5 minutes. Positive: Medium is colorless around the test organism. Negative: If no degradation of DNA occurs, the medium remains green. Used to determine the ability of an organism to hydrolyze deoxyribonucleic acid. Used to differentiate Staphylococcus aureuswhich produces the enzyme deoxyribonuclease from other Staphylococci which do not produce DNase. Particularly useful if plasma is not available to perform coagulase test or when the result of coagulase tests are difficult to interpret. It is also used to distinguish Serratia (positive) from Enterobacter sp. Agar must be inoculated with a suspension of a young broth culture (4 hours old) or an 18- to 24-hour colony in 1-2 mL of saline. Some MRSA strain do not give positive result and some strain of coagulase negative Staphylococci such as Staphylococcus capitis give weak positive reaction. 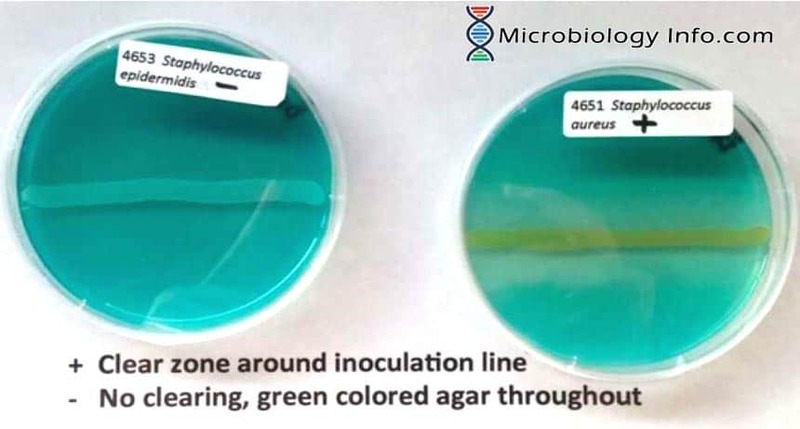 For Moraxella and Gram-positive cocci with TBO testing, a low inoculum can result in a false-negative test, since these organisms may not grow well on the medium. 1N HCl is bactericidal for staphylococci. Once the HCl has been applied, the test must be read within 5 minutes and cannot be continued by re-incubation.